Resort is a 4 minute free shuttle drive to the Candolim Beach with a host of water sports. Minutes from Calangute and Baga beach. The Bali styled resort overlooks lush paddy fields, palm trees and hills. The Resort features 121 bright rooms and suites and enjoy free drinks on arrival. The resort features Asian styles water bodies, lily ponds, zen inspired tranquility zone, private cabanas, vitality pool with an outdoor Jacuzzi. Equipped with over 30 activities, sports hub, kids club, gym and cycles. Short drive from the Saturday Night Market & Infantaria. Close to Goa's famous night life. Centrally located with the largest ballroom, dedicated events team and unique theme breaks. 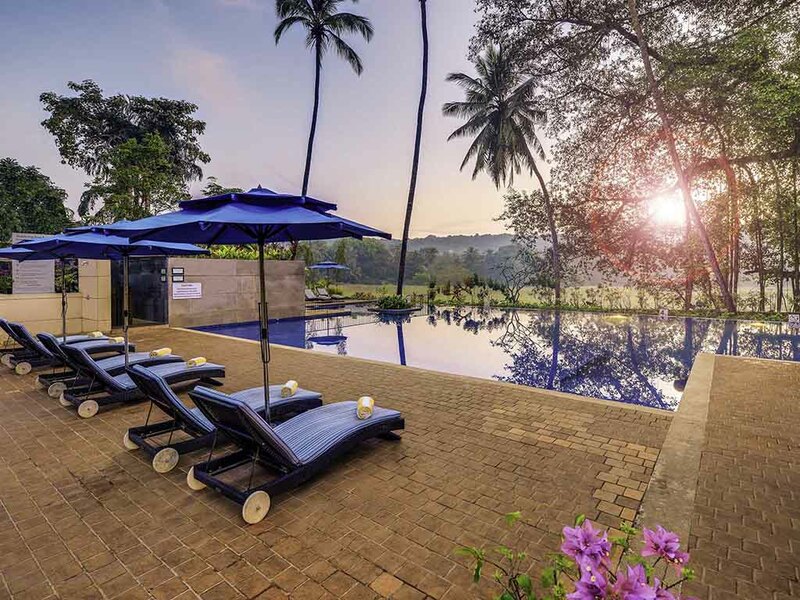 Surrounded by lush greenery, bright rooms, unique Balinese-styled design spa with 5 chalets & Hammam bath, vitality pool, zen inspired tranquility zone. Food & Beverage outlets serving global cuisine with a local touch and 8,000 sq.ft. Convention space. Tranquility Room with Buffet Breakfast and access to Banyan Lounge, 15 % Disc on Food & Spa. Our Signature Mediterranean Restaurant offers dishes with a modern twist-combining locally sourced ingredients. Take a breather from the sizzling the lush green scenes and settle into the intimacy of this relaxed sanctuary. The Food Exchange is a modern, all day dining restaurant with an alfresco kitchen overlooking the green paddy fields. A multi-cuisine menu cooked in unique styles in individual show kitchens allowing guests to have direct interactions with chefs. Chy is our lobby lounge & bar at the lobby level. Serving grab & go drinks and food, collectables, exotic teas and a unique bar and food menu all day long. Pool side bar, under the great Banyan overlooking paddy fields. Offers a selection of hot and cold beverages and snacks.